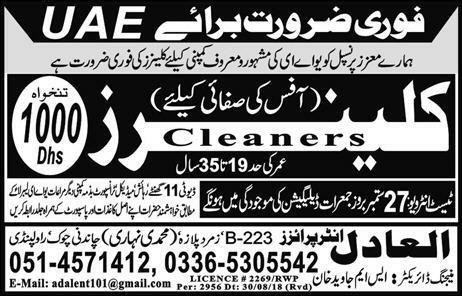 UAE Jobs 2018 has announced in Express Newspaper on 19.9.2018 Office Cleaner Vacancies are printed today in daily newspaper Pakistan. Al Adil Enterprises of Rawalpindi are publishing the new Jobs in UAE and Dubai where lot of Labor seats is required through SM Javed Khan the manager director of this association. Directorate of Special Education Punjab Lahore 05 jobs 22 December 2017 Daily Pakistan Newspaper.